Osteopathic graduates are highly sought out by residency program directors in the United States. 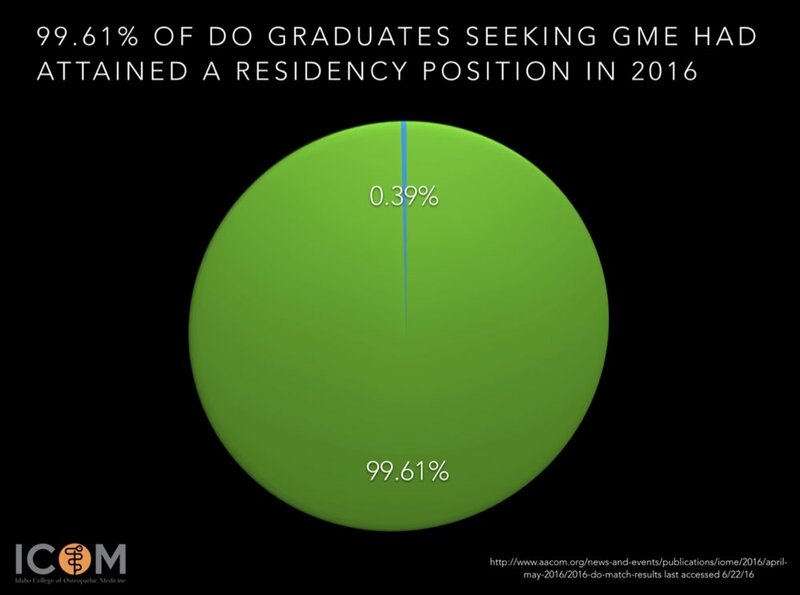 In fact, over 99% of osteopathic graduates obtain placement into a residency program the year that that they are graduating. Our nation has never graduated enough physicians for our domestic residency programs. For example, 25.9% of US residency programs are filled with foreign medical graduates which has contributed to what has been called "brain drain" in other parts of the world. It has also created artificial market forces for US citizens to leave the country to seek training elsewhere due to lack of medical school opportunities in our nation. ICOM provides a mechanism to assist new and existing graduate medical education (GME) programs in meeting the requirements for accreditation by the Accreditation Council for Graduate Medical Education (ACGME). These include seed funding opportunities, accreditation assistance, faculty development, and educational assistance for new and developing programs. If you are a hospital or healthcare institution in Idaho, Montana, Wyoming, North Dakota, or South Dakota and you are interested in learning more, please contact the Office of the Dean at mneubauer@idahocom.org.